What brought you to this position? My journey with Volunteers of America Michigan started in July of 2013 while I was working towards my Masters of Counseling at Spring Arbor University. 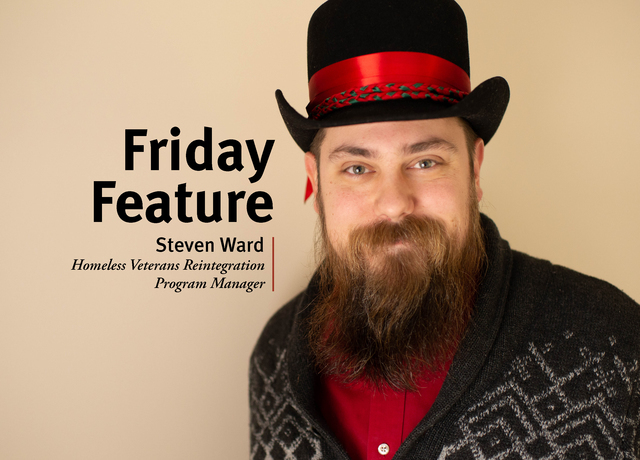 I was able to set up my internship in the Lansing veterans housing program and eventually ended up working full time in the homeless veterans reintegration program manager. Since that time, I’ve never looked back and here we are today. What is your biggest takeaway from working with Volunteers of America Michigan? I am so grateful to finally be settled in a field that helps make my life-work line up with me life-mission. I am also quite humbled to be able to live a life that allows me to focus directly on serving such a large number of people. At times, it seems almost surreal that the department and the team that I’m fortunate enough to be part of, has had the ability and the opportunity to serve so many across such a distance. Lastly, I am thankful that this position and my work is more rigorous, challenging, and more difficult than I ever thought it could be, in the best way possible. What is your biggest challenge in this position? As my foot print and responsibility within the department has expanded, I have had to focus on the bigger picture and being the leader that my team needs me to be. Where is your dream vacation spot? Someplace beautiful, where I can hike, eat, take photographs, and palaver with friends, family, and loved ones. Preferably with lots of green land, mountains, hills, rivers, beautiful music, and good food. Where the cell phone signal only works when I want it to. What is your favorite book? It would be nearly impossible to pick just one. I suppose, if I had to pick one book to take with me to a desert island, it would probably be “A River Runs Through It” by Norman Maclean. But then again, it might be “Enders Game” by Orson Scott Card. How do you spend your time outside of the office? Almost all of my free time is spent in the presence of my wife and sons. It’s a simple life full of things like boy scout camping trips, board games, teaching my children how to make things, family movie nights, silly arguments between children, silly arguments between children and a dog, silly arguments between children and their parents, and other delights of the mundane. Sometimes, when things get really crazy, we even go out to dinner together.